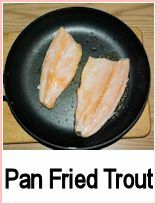 Well - this started off as fish grill recipes, but I realised that many of these recipes would be great cooked on the barbecue. Some of you are going to be lucky enough to live in a climate where you can safely plan to barbecue, but here in England, we can never be sure of the weather. At the beginning of March 2006, we were brought to a standstill by a day of snow - three weeks later, we were in the middle of a heatwave and people were walking round in shorts - it's unreal. My son, who was 15 at the time, even commented on the change - it's a very British thing to do and he obviously became a Briton at that point! As a result of this unpredictable weather, it is often necessary to alter our plans to have outdoor gatherings and move them inside. 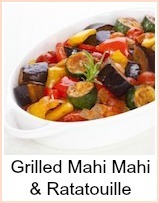 Most of these recipes will be suitable for either grill or barbecue. Fish steaks will take between 3 and 7 minutes, depending on their thickness - a split lobster will take about 15 minutes. 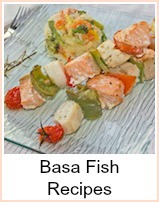 I think you'll find that the timing of barbcued fish is not much different to grilling fish - so be guided by the times in the actual recipe you're following - whether you're using the grill or the barbecue. 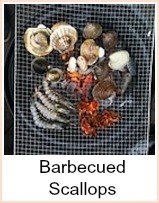 Fish which is grilled or barbecued often has a marinade - not to tenderise, but to flavour and help protect from burning. The details for these will be in the individual recipes listed. Marinades will also be found in the Seafood Sauce section. Enjoy these recipes - and have fun BBQing. Quick and simple kebabs - serve with warmed pitta breads and salad for a complete meal. 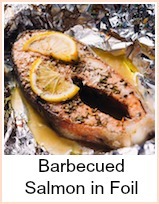 Barbecue Salmon, marinaded in white wine and cooked in a foil parcel. 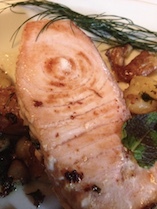 Barbecued Salmon Steaks - simple and delicious and high in Omega 3s - good for your heart. 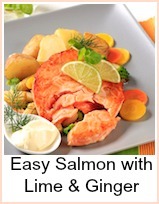 My friend Maria, has submitted this great barbecued salmon recipe. It is marinaded and then baked over coals. She reckons that cooking outdoors gives a flavour to food that no seasoning can match. She's right you know and on her site are some unusual ideas of cooking techniques for the great outdoors. 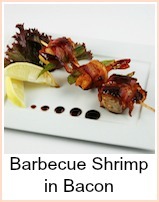 Another recipe from Mike at Gas Grill Review Fantastic shrimp wrapped in bacon with a cheese and basil stuffing - wow! 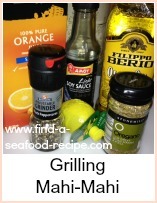 This amazing scallop recipe is submitted by my friend Mike from Gas Grill Review. The recipe is really easy and his website is an excellent resource for information and advice on gas grills and barbecues. This cod is pan fried, but it could be barbied or grilled. 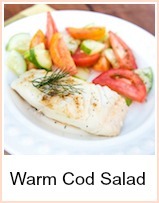 Delicious summer salad that would go with any white fish. 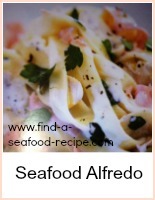 It is rich in Omega 3s as well as quick and tasty. 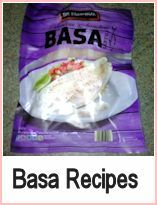 Basa fillets basted with a dijon mustard coating - quickly grilled, this is a delicious way to eat any type of white fish. 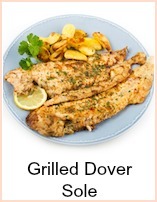 Simply grilled Dover Sole with parsley butter. Grilled Basa Fish with a mexican style avocado salsa. Simple and quick to prepare. 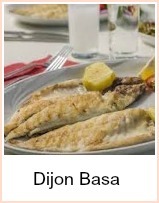 Plain grilled Dover Sole. A classic fish served simply. 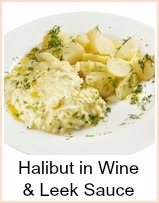 Meaty halibut or turbot steaks grilled and served with a creamy mustard sauce. 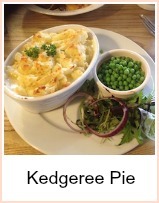 Good with new poatoes and plainly boiled green vegetables for a complete meal. General guidelines for the beginner who wants to grill fish. 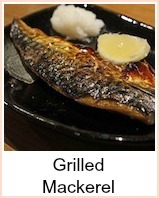 Lovely grilled or broiled mackerel. So easy. Recipe for a tasty chopped salad to go with it. Serve with new potatoes for a complete meal. A simple grilled mahi mahi on a bed of roasted vegetables. 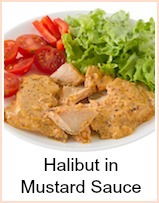 This is a simple marinade recipe which would be suitable for any fish you want to cook. Simple recipe for halibut, marinaded, then quickly grilled and served with a caramelised leek sauce. 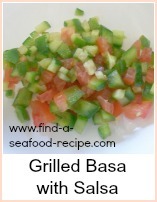 Grilled fish can be a bit dry, but this salsa - very much like Rubio's salsa - will add some flavor and moistness. 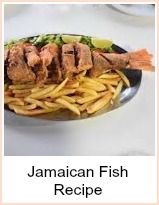 Spicy Jerk seasoning bastes whole fish which can be either grilled or barbecued. Jerk sauce will keep in the refrigerator for about a month, so you could make extra for another time. 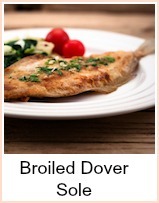 This simple fish recipe is not strictly speaking a grill or barbie - you do brown the pie under the grill though, so I've put it on this page ;-) Really easy dish and you can use up any pieces of fish you have lurking in the depths of your freezer for it! 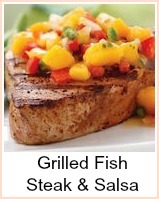 A couple of grilled mahi mahi recipes - one with lemon and parsley butter and the other with a salsa salad. Suitable for barbecue as well. 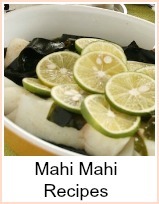 Use mahi mahi any time you would have used swordfish, tuna or halibut steaks. 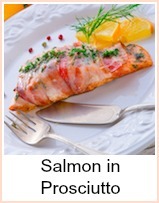 This easy salmon recipe has been submitted by my friend, Carly from Famous French Desserts which has a sumptuous selection of French desserts, high-quality recipes, and step-by-step instructions. 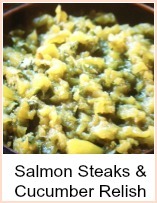 A simple marinaded salmon steak recipe with a cucumber relish that you will use over and over. 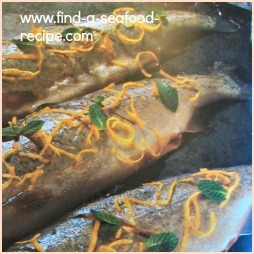 Try this one - trout marinated in tarragon, vinegar, oil, dijon mustard and then barbecued - absolutely beautiful. 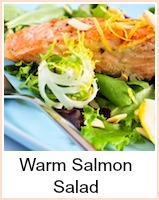 Grilled salmon served on a bed of mixed salad and a cool minty yoghurt dressing - a perfect recipe for summer.